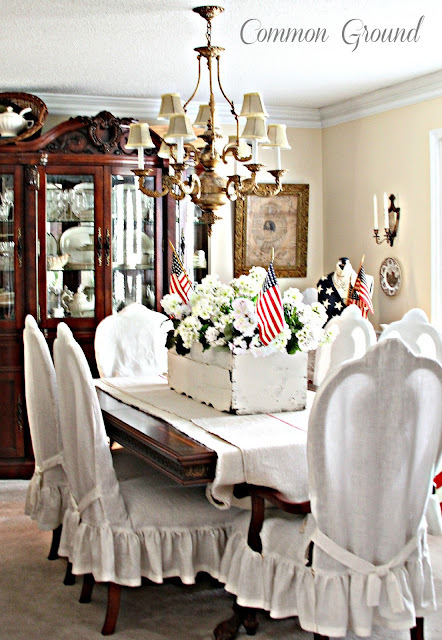 I wanted to do something different in the Dining Room this year to honor the July 4th celebration. I think we all love vintage dress forms and I think they're the perfect way to "dress up" any Holiday. I have two in my office/studio that I keep my vintage necklaces on, but this one little gal had been used in one of my antique mall spaces, but was now relegated to the garage stash. I think she's beautiful all decked out in her Patriotic finery. A vintage lace scarf, triple strands of 60's costume jewelry pearl beads, and one of my vintage clock necklaces add to her girlish charm. 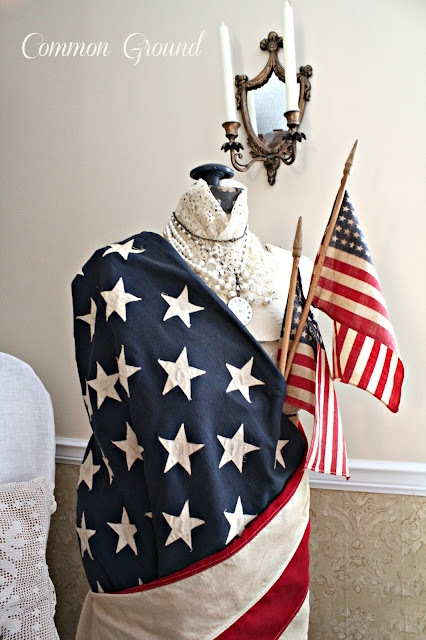 As for this display, it is a vintage flag draped over my dress form. I would never destroy a flag by cutting it up for clothing. All the flags I use are over 50 years old, and have been placed where they will not be harmed or treated disrespectfully. and little old parade flags for the July 4th Holiday. on top of some bleached burlap for some extra coverage. I searched the web for "vintage look" flag pillows, and while I found some great ones, nothing had the old look I was hoping for. Then, when I was getting my parade flags out of storage I realized one was loose from the "pole" so I just added it onto this old ticking pillow that my husband's grandmother had made about 60 years ago. 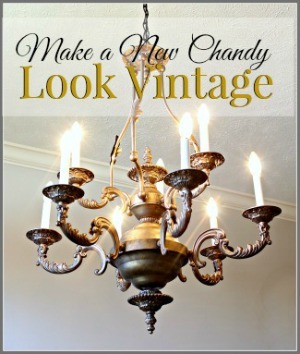 So easy and gave me that perfect aged vintage look...'cause it is! challenge me to find other ways to decorate her for the seasons and Holidays. Don't forget that Be Inspired will be going live early this week. 7 PM Central Wednesday evening. July 3rd. "About my use of the flags in decor, and this is my personal opinion: because these flags are antiques and relics, and not "dedicated to service or actively commissioned flags" I don't feel it's wrong or disrespectful to use them as I have. 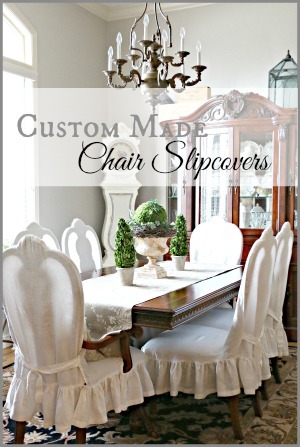 They have been salvaged from flea markets, antique malls and swap meets, etc. where I found them boxed, folded, and wadded up in corners and under tables. So my use of them in display, to me, is perfectly respectful and honoring of my love of Country and the American flag." love the fresh patriotic look! Well done, Debra- and that is a good "disclaimer" at the end......I think it is a GOOD thing to be Patriotic and display the flags - they aren't doing a bit of good hidden folded and disregarded. 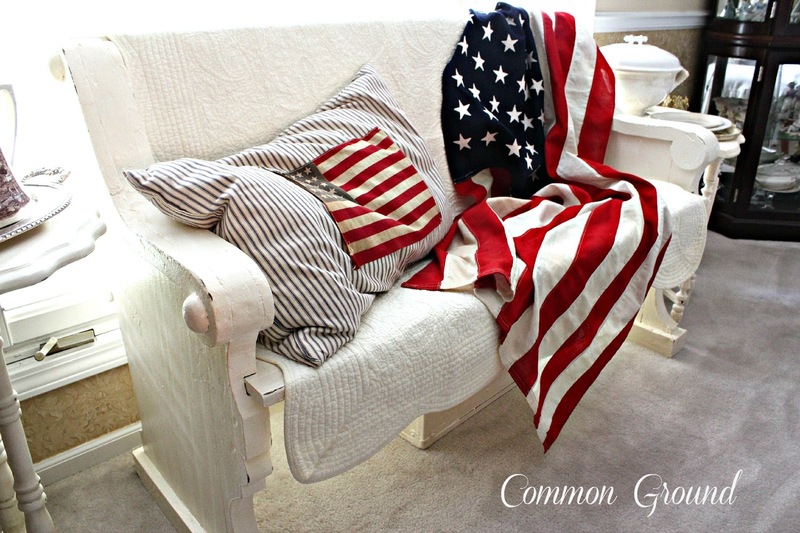 She is quite lovely in her flag dress but I love love the ticking stripe pillow. I am happy to report we now have 14 flags outside. What a perfect display of patriotism, Debra. 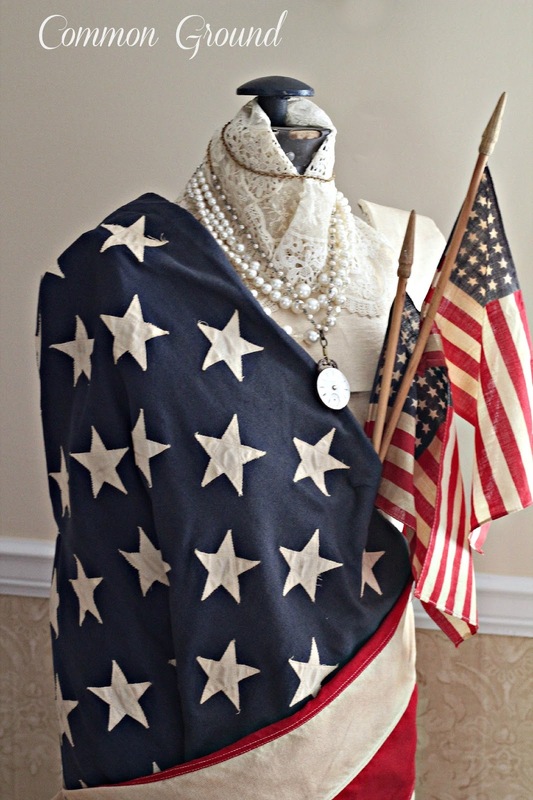 I love what you've done with the dress form - she looks so lovely with the vintage flag adorning her. And your pillow with the sewn-on flag is so amazing! The dress form flag display is just fantastic! Very clever. Love all your red, white, and blue...especially your beautiful dress form. 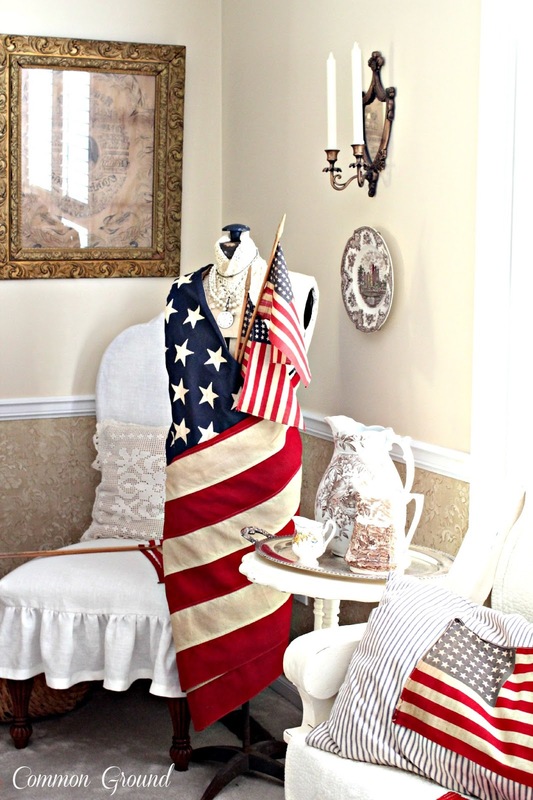 You've come up with some amazingly creative ways to display your vintage flags, Debra! I especially love the pillow. 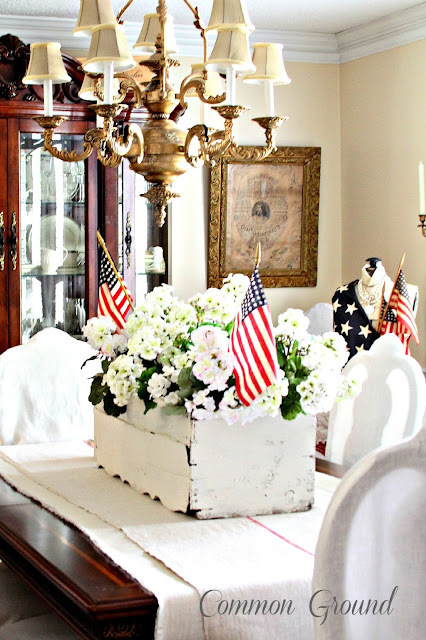 Your table is so very pretty and patriotic...lovely arrangement! 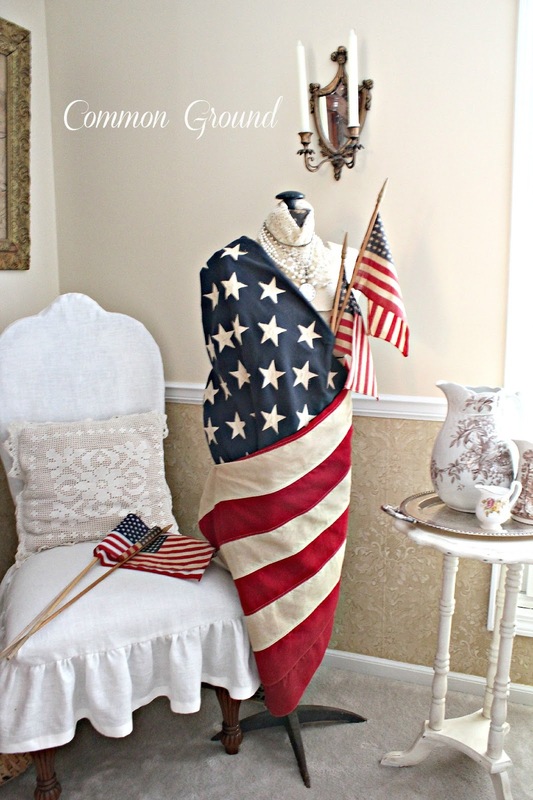 FABULOUS patriotic decorations throughout your home. I love the White box in the dinner table, the pillow you made from the old flag, just awesome! I enjoyed this post. Come over and visit. Have a nice Fourth weekend ahead. You got such a knack for decorating! Love it! 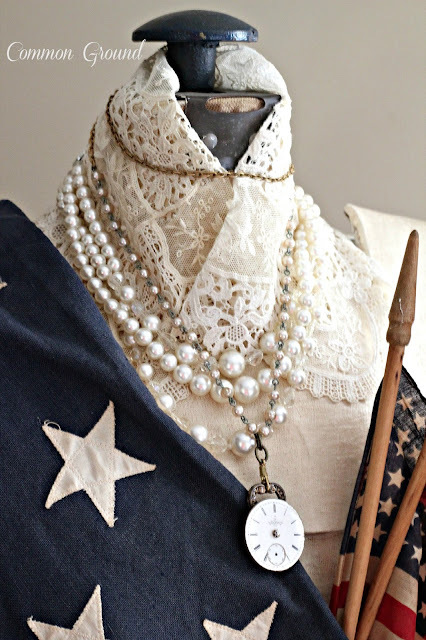 I Love, LOVE, L O V E how you've clad your dressform with Liberty!!! She is elegantly displayed!!! 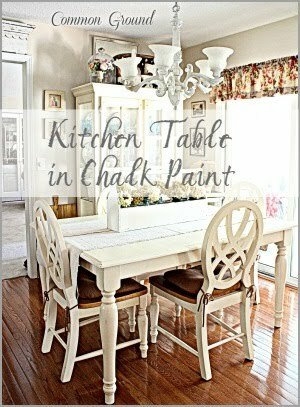 Your dining room and sunporch look amazing!!! Happy Fourth of July, dear freind!!! 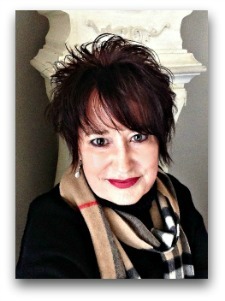 Debra, you lady is fantastic! 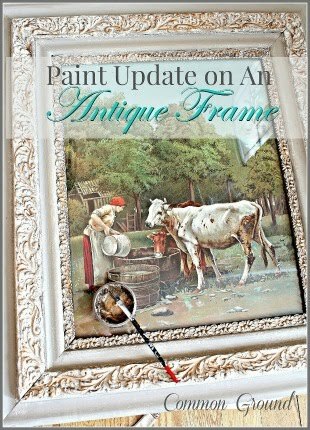 Those vintage images are the perfect inspiration for this piece. Love this! I would never have thought of glamming up my dressmaker's form in patriotic stars and stripes, but yours looks quite fetching! I love the ticking pillow with the addition of the flag, too. What a great idea! When I first saw her I immediately thought of that third picture you have in the post of the vintage postcard. I am pinning your ideas for next year. Hooray for the red, white, and blue. Your Miss Liberty is perfect and your ticking pillow...inspired! I agree with your disclaimer. I feel we should never worship Old Glory...only honor it and you have done that beautifully. Love the dress form! and the old ticking pillow. Love it so much, I had to pin your dress form Liberty! Great post! Happy 4th Debra! Love your Vintage Patriotic Dress! She's stunning! 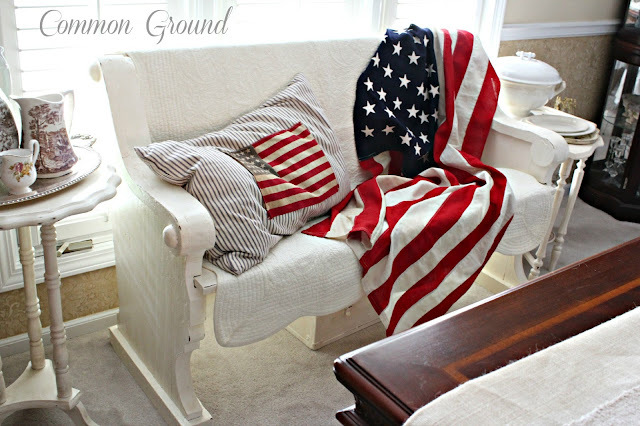 Love your beautiful room full of patriotic touches...perfect! Love all of your patriotic décor! The dress form wearing the flag was a great idea. Love the pillow you made too. That flag pillow looks so cute on the bench. Oh, I love it all!! Your dress form, the pillow and the flower box-perfection! She's very elegant, Debra! On a side note, I was cleaning out my SPAM folder today and noticed I had a ton of comments I had sent to people sent back to me. Yours were some of them. I'm not sure exactly what happened, but I think I may have closed out a window too fast and it may have not sent the comments then. Apologies if it looks like I've been gone, I didn't mean to be! I've been reading about your wreath, your prayer blog, etc. Have a blessed 4th! Debra, this is wonderful. Great detail everywhere! I don't use red in my decor but I sure do love to see it used in other homes. Debra, your Miss Liberty mannequin & that ticking pillow are outstanding. I really like both. 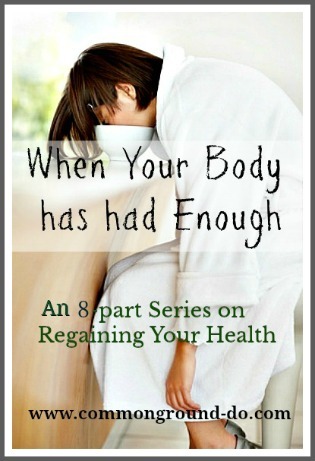 Thanks for still taking time to host Be Inspired this week. 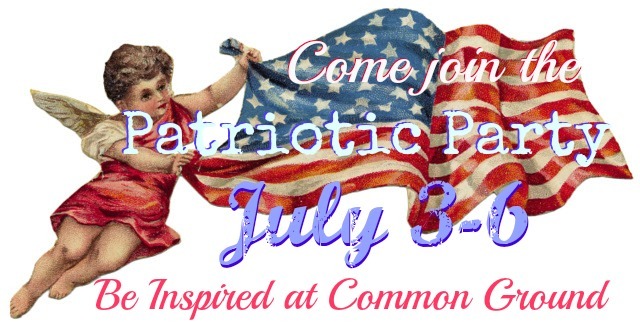 It is a busy week, but after the rush on the 4th, it's great to relax & view all the creativity. Appreciate ya! Everything looks wonderful..very nice, indeed. Debra, everything is beatiful, and I especially love your dress form. She is wonderful. 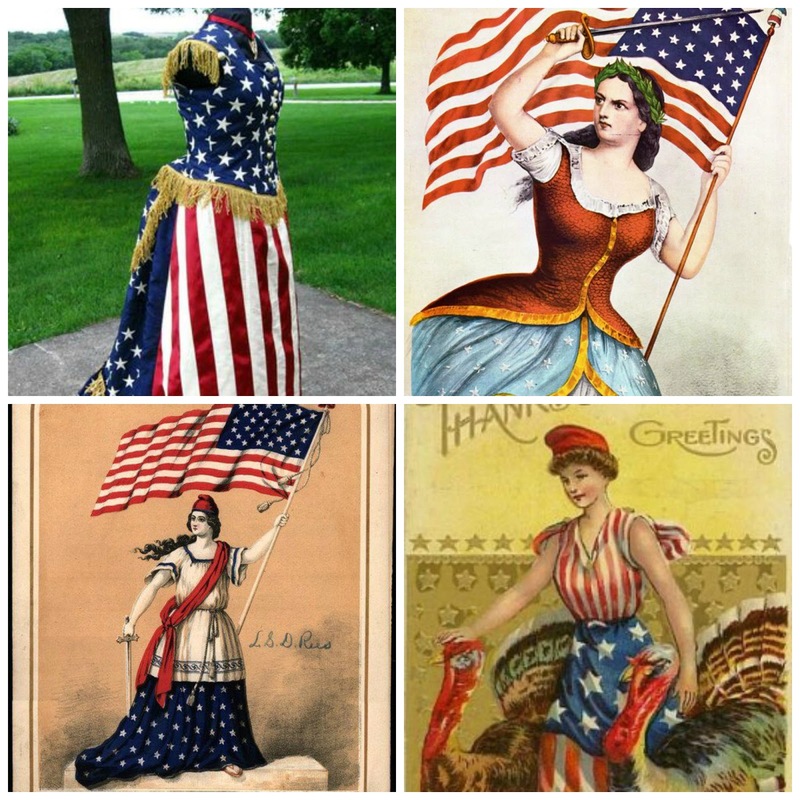 She is beautiful draped in the vintage flag Debra. Love, love the pillow too! Thanks for sharing with SYC. Hi Debra, featuring you at SYC today. I so appreciate you sharing! I love this Debra! What a great display! 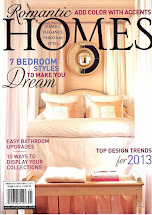 Thank you for joining Home Sweet Home! Oh my Debra, that is exquisite all of it, especially Lady Liberty! I love this Debra! I remember when you posted it back in 2013 and was crazy about your dress form and patriotic decor. 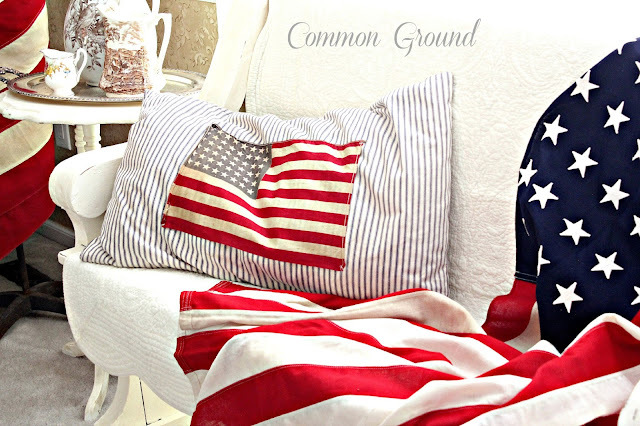 I just saw a few patriotic photos of yours on Pinterest so I headed back here to revisit the posts. Everything you do is classic. 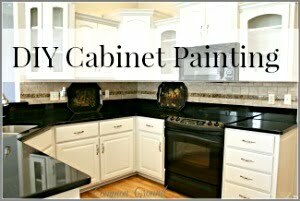 These ideas are still perfect for using in this year's decor. 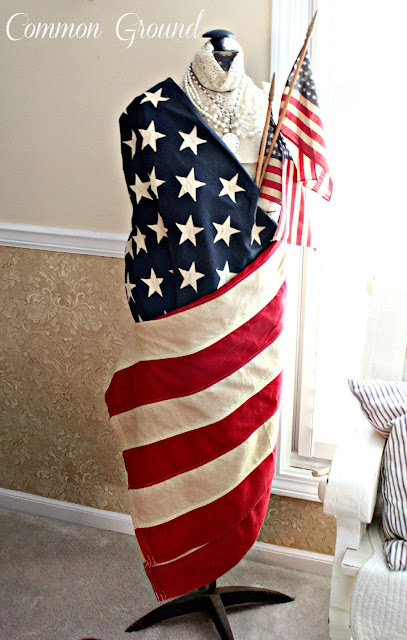 I had already thought about doing some kind of summer or patriotic look on my dress form too. Hope you are feeling "okay." Thinking of you!